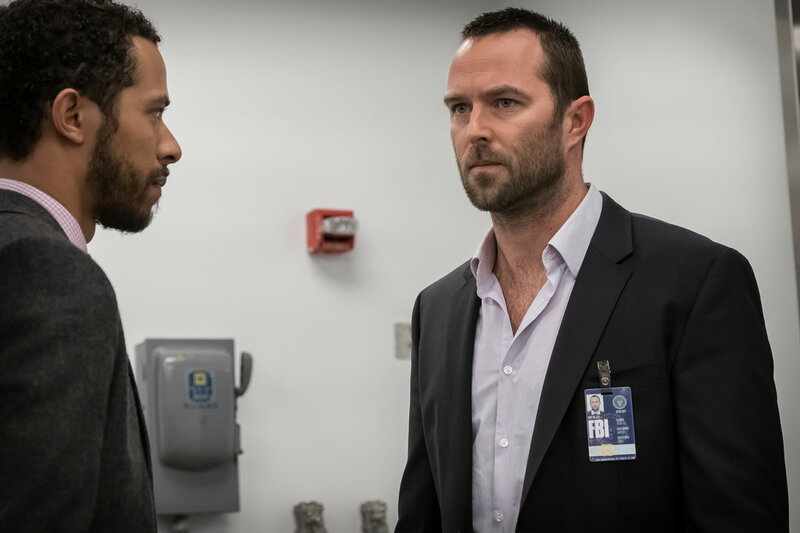 Blindspot finishes their first season with a stellar finale in “Why Await Life's End.” They answer a bunch of questions while simultaneously creating even more in the process. Most importantly, they show how the concept of “blindspots” will continue into next season. So... there wasn't a case of the week! Essentially, “Why Await Life's End” is the fallout from a nuclear bomb. However, there is resolution behind the tattoos. Jane's tattoos were insurance, essentially — a way to guarantee Weller enough “wins” that when Mayfair was finally removed from power, he would be the automatic replacement. What's surprising about the tattoo reveal is how pragmatic it is. They are resume builders for Kurt Weller. Shouldn't it be enough that Kurt is a good agent? Yes it should, but therein lies the catch-22: Kurt Weller isn't the problem; the FBI is. Jane needed a way to ensure that he would get the job, no matter the corruption. The best way to do that is to make the FBI look really good via the tattoos. Essentially, it's a masterful ego stroke to the higher-ups in the FBI. Jane plays politics with the tattoos so Kurt Weller didn't have to. That said, the pragmatism of conquering office politics is a bit like deflating balloon. I wish the reason for the tattoos would be a little fancier than job security, but it is what it is. Reade and Zappata spend most of “Why Await Life's End” searching for Mayfair. They discover something pretty grizzly when Patterson CSIs the warehouse for blood. She finds blood. A lot of it. Too much for any person to survive. Even though I believe Zappata and Reade conceptually understand Mayfair is dead, the grief over the loss of their friend is stopping them from accepting what the physical evidence is showing. Also there's no body, so that didn't help matters. Patterson is MVP of Team Blindspot consistently week after week, but this episode exemplifies why. After Reade and Zappata come clean with all of their secrets, Patterson is furious with them. Furious enough to give them the silent treatment, so Patterson is apparently channeling my mother. The reasons for her anger are simple. Reade, Zappata, Weller, and Mayfair are her family (I would include Jane in that as well, but that is going to change next season). Where the team goes, so goes Patterson's nation. She is willing to do anything to protect her family, including breaking the law. The fact that Reade and Zappata tried to shield Patterson infuriates her because it means they are stopping her from helping. The only way Patterson can deal with the daily dangers her family faces on a daily basis is by helping to ensure their safety. If Reade and Zappata, or any team member takes that from her, she can't cope. It's like having five Davids on her hand. It will break her. Essentially, Patterson is telling Zappata and Reade that they are her people. If they need help dragging a corpse across a living room floor, she's down. Name the time and place. But they have to ASK. That's her only request. That's what matters with family: truth. Secrets and lies only work to sever the bonds between loved ones. The team clings to one another by clinging to the truth. It's something Mayfair recognized in her final moments. She knew there was a chance she was never coming back by chasing after the photograph lead. So, she gave her team access to all the secrets she tried to protect them against. In the end, Mayfair realized that she couldn't really protect them from Orion, and perhaps the only way to arm them against the danger was to give them the truth. So now Reade, Zappata, and Patterson are all in on Orion, but at least they are all in together. The season finale is primarily about Kurt and Jane, and with good reason. The fallout from Mayfair's death and Bill Weller's confession is monumental. Watching Kurt and Jane search for the truth and finally get it is like watching a car crash and being powerless to stop it. Bill Weller's “I killed Taylor Shaw” confession is eating Kurt alive. He runs it past Dr. Borden and his sister. Both have reasonable explanations as to why Bill could confess to something untrue. Sara, in her infinite wisdom, knows the “what if?” will destroy Kurt eventually. She's watched this question eat away at him for years. Even Sara wants to put it to rest. So they drive out to their childhood home and dig under the fort. There's nothing there. The wave of relief I felt (and the sheer terror when Kurt hit that rock) was overwhelming. It is just the ramblings of a confused man in his final moments. The minute Kurt left for the garage for more beer, my heart sank. I knew there was something I was missing; something HE was missing. He sees the camping gear and it hits him like a truck. “Fort” has more than one meaning. Yes, they had a fort in the back yard but Bill Weller also took Kurt and Taylor camping to a beloved location: Fort Boone. When Kurt pulls up to the campsite, we already know what he's going to find, but it doesn't make it any easier. Kurt digs in the rain. His boots become muddy just like his father's did the night Taylor disappeared, and then... he pulls Taylor's rain boot from the ground. A human bone is inside. Kurt dissolves into screams of despair. It is a devastating moment and Sullivan Stapleton does an exceptional job. Sometimes lies feel like a gift because the truth is so horrific, but this is a truth Kurt Weller has to face head-on. Jane didn't need to be Taylor Shaw for Kurt to love her, but the reason I fell in love with the idea of Jane being Taylor Shaw is because it gave a happy ending to something that typically ends in tragedy. Most kidnapped children don't return home. Most kidnapped children are never seen again. If they are, it is only a body that remains. It's a horrific reality of the world we live in and, as a parent, it is the nightmare that keeps me up at night. If Jane is Taylor Shaw, then that innocent little girl is saved from the horror. Taylor Shaw can be Elizabeth Smart and not Madeline McCann or Amber Hagerman. But Jane is not Taylor. Taylor Shaw is dead. Bill Weller killed her. We may never know how or why Bill killed her, but the truth of Kurt's world isn't the miracle. It's the nightmare. Jane used Taylor Shaw as a way to connect to Kurt Weller — as a way to infiltrate the FBI and gain his trust so he would use the tattoos. So they could remove Mayfair and replace her with Kurt. There's no way to sugarcoat this. Using Taylor Shaw to manipulate Kurt is cruel. It shows a complete lack of regard for his feelings. He's simply another casualty to whatever war Jane is fighting with the U.S. government. And yet I know there has to be more to the story. Somehow, I still believe in the goodness of Jane Doe. Whoever she is — whoever she was — must have a good reason for doing what she did. There's another side to this that I cannot see yet. Jane refuses to let her memory be wiped again, so she fights Oscar. There's a flashback of the two of them sparring and “Jane” warns Oscar that it might come down to a life and death fight between them. “Jane” won't know who Oscar is. She won't trust him... and he may not be able to win her back. No matter how much he loves her, Oscar must be willing to do what it takes. Because Jane will. It's a self-fulfilling prophecy, of course. Jane accidentally kills Oscar in the fight. I wish I could say that I mourn Oscar, but I don't. I know he loved Jane and when her memories come back, this will be a terrible loss for her. But Oscar is the cautionary tale. He was never going to win Jane back with lies and, in the end, offered her very little truth. Knowing her favorite tea was never going to be enough to win her back... or win me over. It also means the only person who can corroborate Jane's story is dead. A fact that is not lost on her when she finally comes face to face with Kurt Weller. Kurt is enraged, and rightfully so. He knows the memory Jane shared about fishing couldn't possibly be real which means that she's in on the manipulation. Kurt muses coldly about how they never stopped calling her Jane. It's true. The truth was always there in front of them, but neither Kurt nor Jane were ready to see it. Kurt takes out the handcuffs and arrests Jane and the “blindspot” concept becomes blindingly clear. This show was never about Jane's tattoos. It's about the person Kurt Weller saw. We all have hidden sides, but loving means revealing all sides, seeing all sides, and accepting all sides of someone. Kurt always had a blindspot when it came to Jane Doe. It's one Reade pointed out repeatedly. He refused to look at the whole picture, or even consider Jane was manipulating him, because he needed to believe Taylor Shaw was alive. Now, Kurt believes he sees the truth. He believes the blindspot is gone. He sees Jane Doe for who she really is. She's not Taylor Shaw. She's a liar, a con artist, and someone extremely dangerous. Boy, the Blindspot writers sure know how to blow apart a ship don't they? So is that it? Kurt only loved Jane because she was Taylor Shaw? No, that's not where this story ends. We're just getting started. Jane has done a lot of damage. Damage she has a duty to repair, and trust she must earn back. There are mistakes she can never fix. Mayfair's death and betraying Kurt are things she can never take back, no matter how much she tries. But even if absolution never comes, Jane still needs to try. And Jane will try because there is more than just one side to a person. The truth is, the memory wipe didn't erase what was instinctual in Jane. Her compassion and bravery are things that are innate. She has a need to do what is right and to help others. That's who the character is at her core. That's who came out of the bag. That's the woman who reached out to touch Kurt Weller's face, searching for a starting point. That's who Kurt saw. That's who Kurt fell in love with. That woman is still there, co-existing with the woman who lies and manipulates. Maybe whoever Jane was before the memory wipe doesn't deserve forgiveness, but maybe Jane Doe does. The only way Jane will find out is if she puts herself back in the driver's seat. Instead of looking to the woman she was for answers, Jane needs to be the woman she is. That's the only way to salvation. As for Kurt, he thinks he sees the real Jane Doe now. Kurt believes he sees the truth. His blindspot for Jane Doe is gone. But it’s not true. Before, Kurt could only see the good in Jane. Now he can only see the bad. His love blinded him to the darkness in Jane. Now, his rage blinds him to the light in Jane. He's simply trade one blindspot for another. This is how Blindspot's concept will continue on, even after Jane's identity is revealed. Identity is defined as “the fact of being who or what a person or thing is.” Who Jane is? Well, that is yet to be determined, but she won't reach any resolution on the matter until she knows and understands all sides of herself. The same can be said about love. Falling in love with someone isn't about seeing one side. It's about seeing all sides and accepting them. Kurt and Jane will pull back the layers of who they are bit by bit, until there are no blindspots left. And when that day comes, they will find their way back to one another. The show isn't just about creating blindspots. It's about obliterating them. Yes, Jane had her memory wiped but she also got a way better haircut in the process. So it's not a total loss. Those were some serious hoops Reade, Zappata, and Patterson jumped through to guess the code to Mayfair's safe. “I'm sorry.” Ugh. Mayfair makes me cry. Still no real answers on Orion, but we've waited this long, so I guess a couple of more months won't kill us. So are the tattoos even necessary anymore? It'll be interesting to see how Blindspot uses them next season. Regardless of their reason, they still are clues to stopping crimes, which is always a good thing. I bet Jane removes the tattoos next season though. Great first season, Blindspot! Best new show of the season. Bring on season two! Great recap. Really good show and an excellent finale. Tattoos will be used to track Shepherd. Oh!!! That's a really good idea. I bet that is what they'll use them for next season. Your review was excellent, but I will disagree , 23 episodes not to answer anything? We already knew the possibility of she not to be Taylor because of the tooth, the last episode NOTHING was answered, only the mayfair, knew of Orion so what? very little and kurt arrested Jane for what, What are exactly the charges against Jane? he broke into her house without a warrant, 2x. and have no strong reason to arrest her, and was still drunk, he does not know if is taylor´s bone without a DNA test. she could tell that pretended to remember to be friendly.